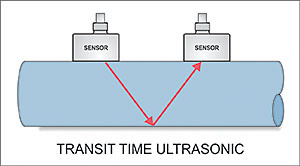 Doppler vs. Transit-time Ultrasonic Flowmeters: Which is right for you? 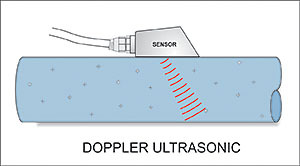 Ultrasonic flowmeters typically use two techniques for measuring flow: Doppler and transit-time. But, how do you know which method is right for you? First, you need to answer the following question: are bubbles and/or solids present in your process? The liquid must contain gas bubbles or solids for Doppler measurement to work. A single-head transducer acts as both a transmitter and receiver to determine change in frequency when a sound wave is transmitted and when it is returned back to the sensor. Sound waves will return at an altered frequency if there are gas bubbles or solids present in the moving liquid. The sound waves emitted by Doppler flowmeters bounce off these small particles, creating a “Doppler shift”. This change in frequency can be used to determine the velocity (flow rate) of the carrying fluid. Without small particles or bubbles present in the liquid, we would see no change in signal frequency and therefore be unable to determine flow. This is why Doppler flowmeters work best in dirty or aerated liquids, like wastewater and slurries. If your process involves clean liquids like water, oils and chemicals, transit time flowmeters work best. In transit time measurement, a sound wave is transmitted by one transducer and received by another. So, transit time measurement requires the liquid to be acoustically clean enough for signals to pass between two transducers. Upstream and downstream time measurements are compared to determine flow rate. When the fluid in the pipe is not flowing, upstream and downstream transit time will be the same. When the liquid is in motion, sound will travel faster in the direction of flow and slower against the flow. The difference between transit times is proportional to the flow velocity and can be used to determine flow rate. GE’s TransPort PT878 is a clamp on flowmeter that can be used for both clean liquids and those carrying entrained solids or gas bubbles. Because of its non-intrusive design, the PT878 can provide accurate, drift-free flow measurement for a wide variety of liquids. It measures flow from outside plastic, metal or concrete-lined pipes using clamp-on flow transducers, so there’s no pressure drop, leaks or contamination. The PT878 uses GE’s patented Correlation Transit-Time signal processing to determine flow and since it is self-contained and portable, the PT878 is ideal for short-term flow survey applications.